Leading Manufacturer of hdpe pipe plant and pvc pipe plant from Ahmedabad. As an acclaimed and renowned entity, we are highly engaged in offering a premium quality collection of HDPE Pipe Plant, which fulfills the variegated needs of different industrial sectors. The products offered by us are manufactured using only high-quality components under the supervision of experts. Moreover, the products offered by us can be availed by our customer at industry leading rates. Heavy duty helical gear box with (In built thrust housing. We are well known enterprise engaged in developing best in class PVC Pipe Plant. The offered plants are synonymous to efficiency and trusted widely for its cost saving operations. 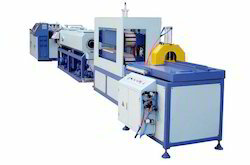 Our offered plants are equipped with leading quality extrusion lines and next generation vacuum pumps. These plants are developed from industry approved components and can be ordered from us in application specific requirements at a nominal price.